This week we got to experience the reality of living in the desert. Staying downtown amongst the shiny glass and metal skyscrapers it is easy to think we could be living in any modern city. But when the wind blows in from the desert, bringing with it the fine sand/dust that makes up most of this country, you are reminded that this city was built in defiance of nature and the harsh conditions that make up this country. Yesterday was one such day. It dawned hot and sunny, like every other day, but over the course of the morning the air became thicker and visibility deteriorated. Even inside our apartment, where there are no windows that open, the smell of dust is pervasive. Gradually our view disappeared until we could only make out the city buildings within a block or two. As night fell our usual vista of sparkling lights reaching the horizon was completely invisible. Today it started to clear and now the view is pretty much back to normal. This is the first time we have experienced such a thick blanket, but I believe it is not unusual. There is almost always a layer of dust in the atmosphere, which is a normal part of life, but this was something else, and I was very glad to be able to spend the day indoors. PS We have found an apartment, and are moving in on Friday. This time we have met both the owner and his wife, so are confident there will be no repeat of our last minute gazumping this time! Sorry to leave you on tenterhooks for so long. Photos and full description to follow, once we (and our furniture) have moved in. 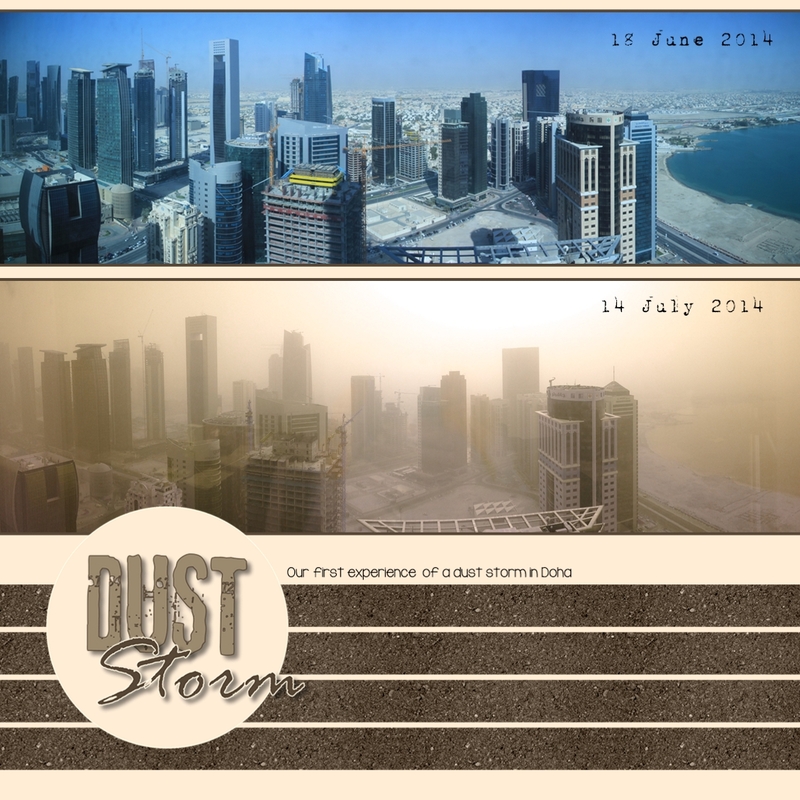 Posted in DohaTagged Doha, dust, Ex-pat, Qatar, sand stormBookmark the permalink. Wow. I can’t imagine having to be outside when that kind of dust storm arrives. Stay safe! I remember working in Melbourne at an office high up in the Collins Towers and seeing a red dust wave coming towards us. It was so eerie, but spectacular as well. Back in the day where we didn’t have mobile phones, and we certainly didn’t carry cameras around with us all the time! It’s wonderful that you can take photos so readily and capture these moments so easily now – especially times like this! I’m sure this will be something that you will get used to in your new home. Just hoping you are always inside when it happens!